In the locksmith world, the age-old debacle between replacing locks versus simply rekeying them continues to persist. Most homeowners tend to value security, but they’re also in search of a good deal and they’re not going to put any more money into their home than they have to. This is also the case for rental property owners who care about the security and comfort of their tenants, but are also looking to save some money here and there. Whatever security option you choose, rest assured that Sure-Lock Locksmith can handle all of your residential and commercial lock and key needs here in Southwest Florida. From Bonita Springs to Ave Maria and all around the greater Fort Myers area, we’re your reliable locksmith company. Learn more about how our commercial and residential locksmith services can help you. What Does Rekeying a Lock Mean? That’s a logical question and a great place to start. Replacing an entire lock is self-explanatory, but rekeying a lock actually changes the working key of the key hardware to a different key. Simply put, you’re keeping the same lock but old keys will no longer work in it. Rekeying, in most instances, makes sense if your old tenants moved out and you have new ones occupying your property. Should you decide to rekey your existing lock, know that it only takes a few minutes in most cases. When Should I Rekey My Lock(s)? Let’s say that you just purchased an old house and you’re not sure what the owner history is like. 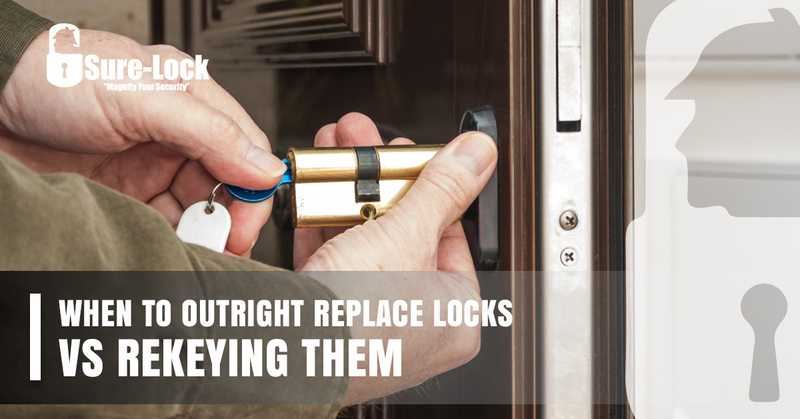 While getting brand new locks might be the highest security option, rekeying the existing locks ensures that the previous occupants can’t get in with the keys that they have. This also goes for rental properties, though it’s the responsibility of the landlord to make sure that the locks are rekeyed. You should also rekey your locks if you accidentally lost your key. It happens to the best of us; just to be safe, you should get your lock rekeyed even though the chances of someone stumbling upon the right lock with your random key are slim at best. Additionally, if you have different keys for multiple locks and you want all of your locks to match one key (a master key), then you should get them rekeyed. Changing your entire lock system often comes down to a matter of aesthetics. If your old door lock looks worn down and you’re putting money into your home before you sell it, changing your locks is the way to go. For more practical reasons, upgrading your security with digital locks means that they’ll have to be entirely replaced. Additionally, if your home has different locks from different lock brands, rekeying them to work with one master key might not work. As such, you’ll need to replace X amount of locks. Our goal is to provide your Florida home or business with the best-fitting lock and key solutions. Get in touch with our lock and key experts in Naples to get started!